Home » Kanab Blog » Uncategorized » BALLOONS & TUNES ROUND UP 2019!!! BALLOONS & TUNES ROUND UP 2019!!! Join us for the 5th annual Balloons and Tunes Round Up! Taking place over 3 days, February 15, 16, and 17, 2019! With nearly 50 pilots taking flight each morning against the beautiful vermilion cliffs of Southern Utah (weather permitting) and 12 bands competing for title of Battle of the Bands, this is sure to be an amazing year! Don’t forget to check out our vendors on Main Street throughout the weekend for one of a kind crafts, food and much more! Don’t miss out! 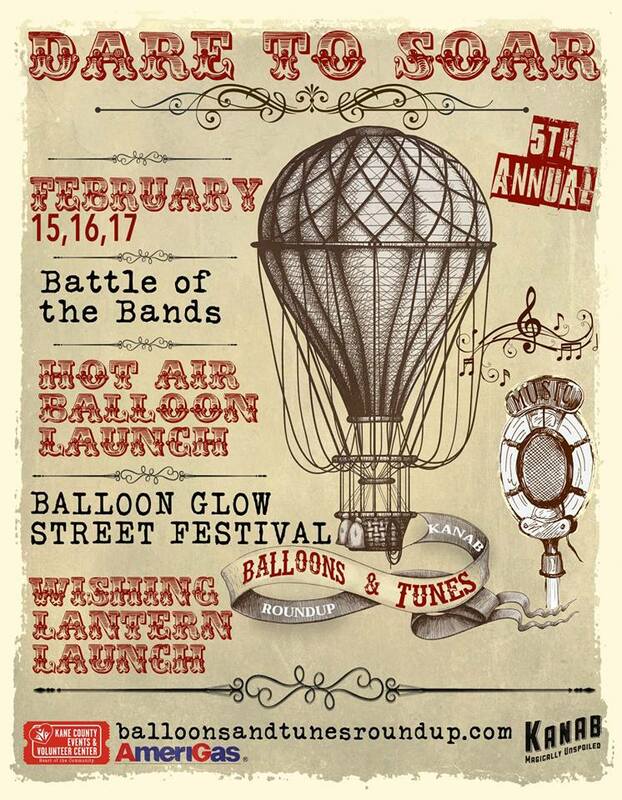 On Saturday night starting at 7:00PM, there will be a Balloon Glow down Center Street with a wishing lantern launch to follow! Sunday, there will be one final Balloon Launch (weather permitting). Don’t miss out on all the fun! Start planning your trip today at balloonsandtunesroundup.com.